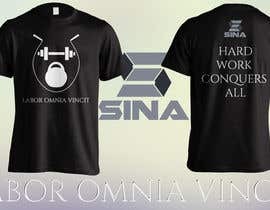 Hello, this contest is to design a shirt for Sina fitness apparel. 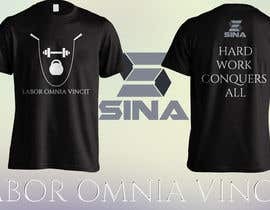 Sina fitness is a fitness apparel line which focuses on apparel for Crossfit athletes, MMA athletes, olympic lifters, and other gym goers. 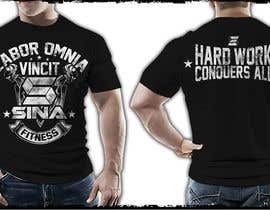 For this particular design we want to incorporate the latin phrase "labor omnia vincit" and its english translation "hard work conquers all". These 2 phrases can be incorporated any way you choose. We do not want the design to be too complicated and would like the phrases to be the focal point. There is no restriction on the space that the design takes up on a shirt. We are trying to avoid designs with people and/or body parts in them. This is not a requirement but we feel that a distressed text style would work well with our vision for this design, but again this is not required and we want to leave the creativity up to you. Good luck. - All submissions must include the image of the design as well as a mock up on one of the two attached templates. - All files must be at least 300 dpi or Vector Format. If your file is not 300 dpi, you cannot just increase the resolution of the file. This is called "upsampling" and will result in a blurry image. If you are creating your file in Adobe Illustrator or another Vector-based software, just size your image to the size you want it to print. - Your design should be sized to the size it should be printed. - If you are creating your file in Adobe Illustrator, you will need to choose "Create Outlines" on all your text. This allows us to open the file without requiring the font. ATTENTION DESIGNERS: Please use grayscale/black and white color schemes for all designs going forward. this is my first contest, not familiar with it and didn't want to place a guarantee as I wasn't sure how many entries I would get. If there are quality entries a winner will definitely be picked. Thank you for the submissions guys, I like them so far but I would like to see less people or body parts in these designs and more focus on the 2 phrases. Thanks guys.